Home Asia Singapore WTH Why So Many Murders in Singapore Lately? Another At AMK! So many murders lately - the cleaner stabbed to death at Causeway Point, the transvestite murdered in his home at Ang Mo Kio, and now the latest in this recent spate of violent crime - an 18-year-old Indian girl, also at AMK. Is Singapore as safe as it used to be? Have we had a couple of months of 'full moons' perhaps? In the latest incident, a 22-year-old male suspect has been arrested in connection with the homicide. 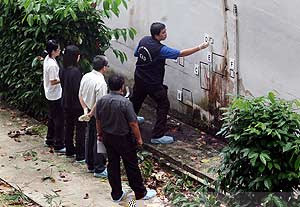 The young girl's body was found covered in blood not far from her home in Ang Mo Kio Avenue 5, early on Tuesday morning (8th July, 2008). It has been reported that 22-year-old suspect left Singapore before the violent crime was even detected. All the Checkpoints were subsequently alerted. 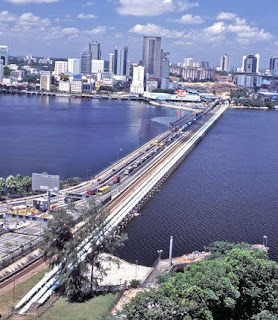 At about 6.15pm on Tuesday evening, he attempted to return to Singapore via the Woodlands causeway, and was immediately arrested at the Checkpoint. The young victim's body was discovered by police after being alerted, at around 7.10 am on Tuesday. Her blood-spattered body was lying between some bushes and the PUB substation near Block 154. This is just two blocks away from Block 157, where she was lived with her parents. She had shoulder length hair and when found, was wearing a black sleeveless top and red shorts. She had injuries to her neck and upper body. She was pronounced dead at the scene at 7.25 am. The police were alerted by Ms Shoba, a resident of Block 154, who discovered the body when she looked out of her window on the sixth floor at about 7am. The teenage victim is believed to be the only child in her family and dropped out of high school some years earlier. A neighbour, Mr Koh Chew Ming, 18, a student, who lives on the fourth floor, said he had often seen the victim hanging around the block late at night on her own or with a 'tall and slim-built Indian boy'. Is this a trend we are seeing - or is it just an unfortunate set of circumstances and timing?